And so I have no doubt that the ending to Heroes in Crisis will be delightful, but I’m getting really tired of these middle issues where nothing happens. I don’t dispute their purpose—we’re getting a lot more character moments that are filling in some of the gaps. But this issue, we get a poetic monologue from a caveman. 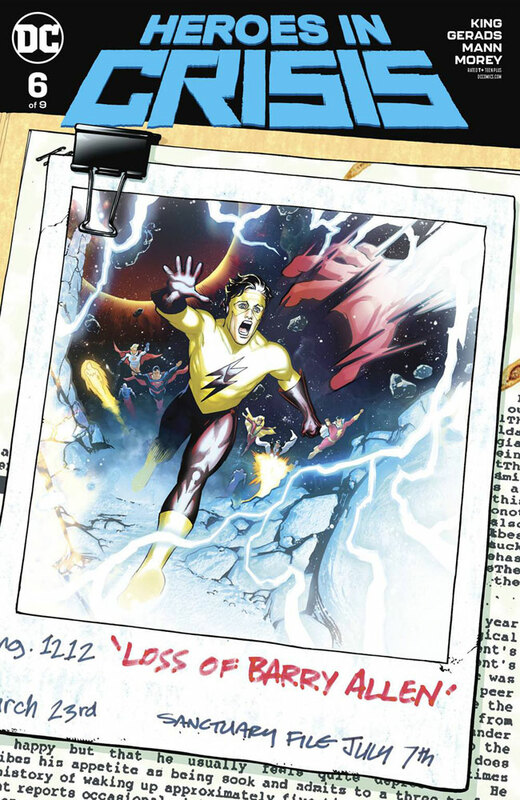 The closest thing we got to a follow-up on last issue’s revelation that Wally’s body seem misaligned with the timeline was Wally’s monologue about why he was in Sanctuary; when he returned as part of Rebirth, he was able to go around restoring other people’s memories of him, but he was also retaining memories of a family that didn’t cross realities with him. I’m assuming this means that Heroes in Crisis is going to end up intersecting with Doomsday Clock, given the latter’s connections to Rebirth and The New 52 and general timeline meddling. While the issue ends with an implied glimpse at who the killer is, I suppose I’m just too aware of this story’s willingness to set and then shift expectations based on careful reveal of limited facts. I am forever appreciative of all the cool historical landmarks that my dad would schedule for us along the way to Disney World, but I am ready to get to Disney World. However, the implication that this will tie into Doomsday Clock makes me worried that we’re driving all the way to Florida and only going to Busch Gardens. Speaking of expensive assortments of flowers, that leads me to Fantastic Four #7–the latest in a series that I started reading again after the amazing wedding special. When we left off last issue, Galactus had returned to Earth, but Dr. Doom had lured him into a trap. 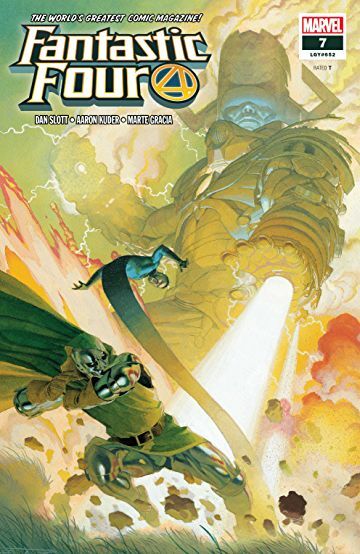 This issue starts with Doom ordering around the Fantastic Four to help protect Latveria, stop Galactus and save Victorious (that’s a person, in case you’re like “That sentence doesn’t read right”). One of the things I love about Dan Slott’s writing is that he captures the very real human interactions that make these superheroes seem like actual people; the mundane elements are given disproportionate prominence against the profound, which emphasizes the family element of the Fantastic Four while also injecting some ironic humor. But it’s a tricky line to walk; go too far with the cute stuff, and get too far out of proportion, and you undermine the seriousness and severity of whatever the threat of the moment is. This issue—moreso than the previous two—felt like it was getting a little too close to that line. Fortunately the direction of the plot was strong enough to keep this in net-positive territory. They may go to the “Doom is up to something, but I can’t tell what yet, so let’s go along with him for now – only to be surprised!” well a lot, but as long as there’s still something good on the other end of the rope, let’s keep drinking that groundwater! I was not super excited about the first issue of this new series. I think I gave it four dots (editor’s note: that is correct). But considering how irritated I was that I only bought it because I forgot to remove it from my pull list, you’d think that I’d remember to remove it from my pull list, wouldn’t you? I FORGOT. But I’m okay with that! Because issue #2 was a lot better, and I’m glad I’m too forgetful to follow through on these decisions (unless you’re Grant Morrison’s Green Lantern, in which case I will remember to remove you from my pull list). Much of what I was griping about last issue stands—the clichés, the tired context, Matt being his own worst enemy and having inappropriately revealing conversations inside large, echoey churches with employees of the diocese. 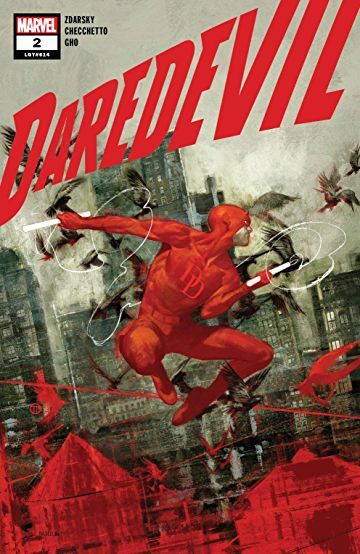 But Chip Zdarsky has found an answer to the question of “What do you do when Matt Murdock and Daredevil have become a boring retread, but you’re kind of stuck with that characterization?” You focus on a fresh character! But Matt is still his own worst enemy. His stubbornness is getting him into a new level of trouble, both from his botched attempt to stop a crime and now from his paranoid refusal to accept responsibility for his mistake. Detective Cole North—presented as a tough, clean lawman who has sights on the Kingpin just as much as he does on Daredevil—isn’t exactly an innovative complication, but it’s all being handled competently enough that I find myself trusting the direction. And ultimately, isn’t that enough? You want to believe as you’re reading these silly books that these details you notice are deliberate and not projections, that inconsistencies in characters’ actions and words are clues and not laziness. You want to know that the time you’re investing in these stories will pay off. Good stuff. Maybe they’ll kill Daredevil!